CEO Rainer Strack, Boston Consulting Group attended the DI Business Summit 2018 and spoke about the ongoing global fight for talented young people – and gave his advice for Denmark. Danish companies are struggling to find enough talented young individuals. Difficulties lie in attracting talents from abroad - and young Danes increasingly seeking employment opportunities abroad. This is the conclusion of a new analysis from the global management consulting firm, The Boston Consulting Group, with over 4000 Danish participants. The analysis shows that 55 percent of the participants would be ready to leave Denmark if the opportunity for an exciting job are greater in, for example, the United States, Germany, or the UK. In comparison, in 2014 this number was 48 percent. “And the proportion is even greater among the younger generation, where 77 percent could imagine working in another country. Thus, it will become increasingly harder for Danish companies to maintain skilled Danish employees”, says Senior Partner and Managing Director, Rainer Strack. 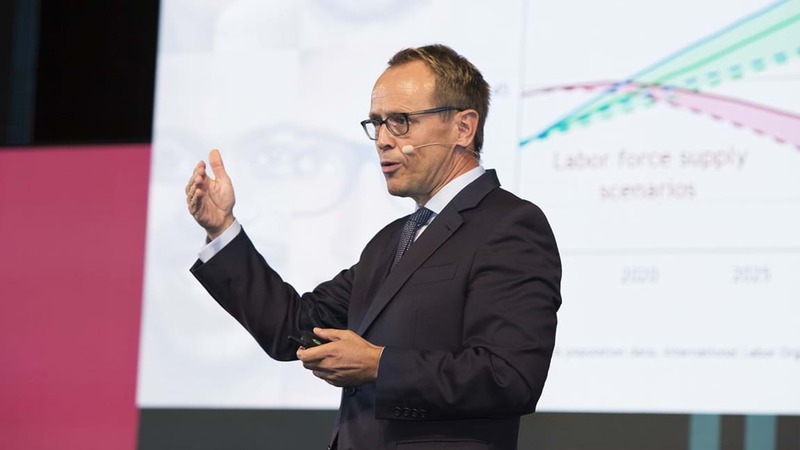 Rainer Strack participated in the DI Summit 18 September, where he identified the challenges of finding and retaining talents. The Boston Consulting Group’s analysis also revealed another negative tendency from a Danish perspective. Globally the willingness to travel for work is generally decreasing. This has several reasons, for example the political situation in some countries which nurtures nationalism. Another reason is economic progress which reduces the need to travel. In addition, jobs are becoming more global thanks to digitalization, so work is easier to move to where people live. However, according to Rainer Strack, there are opportunities to reduce speed of the downturn in talent hunt. An important one is to focus more on human factors, because work culture is a crucial factor for employees. The Boston Consulting Group’s analysis showed that that relationship with superiors, relationship with colleagues, and balance between work and leisure are the three most important topics which matter on the job. "Today, companies have more focus on finance, even though there is no shortage of capital, but lack of staff. Instead, more effort should lie in employee management and HR work," recommends Rainer Strack. There are several places in Denmark which are inspiring, says Rainer Strack. A standalone event may increase reputation as it happened to Germany in 2006 with the football World Cup. The country marketed itself as open, positive and welcoming, which helped to renew the image of Germany. Today, Germany is only topped by the United States when looking at desirable countries to work in. Other countries worth looking at are Canada and Australia, number three and four on the list. Rainer Strack links their popularity to immigration legislation, which makes it easier for high-need employees to access the country. The marketing initiatives should also take place at city level. Globally, New York, London and Berlin are the three largest magnets, while Copenhagen in a period of four years has descended from rank 28 to rank 31. “Here, for example, it could be an opportunity for Copenhagen to brand the city better as a digital hub. You already have a smaller start-up environment but it can be further developed if more work is done to show the opportunities Copenhagen has to offer,” suggest Rainer Strack. Overall, Rainer Strack has no doubt that talent hunt is about survival – equally for businesses, society and cities. Without enough skilled labor, economic growth stagnates. "Robots are on their way in many places and can potentially replace many types of jobs, yet they do not replace the need for critical skills... Today, most countries see a lack of talents which will become even more crucial due to demographic reasons. The contest of obtaining talents is on, thus branding yourself has never been more important and showing your unique selling points compared to competition”, suggests Rainer Strack. • The Boston Consulting Group is a global management consulting firm with more than 90 branches around the globe, one of which is in Denmark. • The analysis "Decoding Global Talent 2018" maps job preferences and mobility of 366,000 participants from 197 countries conducted by The Network and BCG. Over 4000 Danes were included in the research. The analysis is conducted every four years. 1: The company must have an overview of what job functions and qualifications are needed. Strategic Workforce Planning will become more important than Financial Planning. 2: There must be plans to attract different groups of employees. This applies, for example, to women, young people, elderly and digital talents. For each group, it must be clear why they should apply for a job in your company. 3: Focus on current employees is crucial. There must be a plan for developing and further training the employees. Digital continuing education is particularly important. 4: There must be a strategy for retaining great people. It has not been a big problem before, but it will become crucial in the future as employees more often change jobs and job functions become more global.